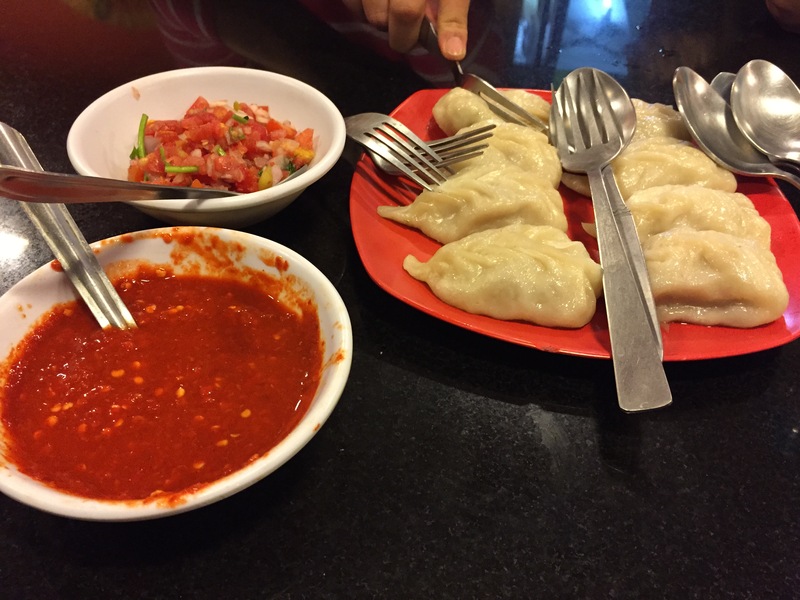 bangalore eats: momos at taste of tibet. 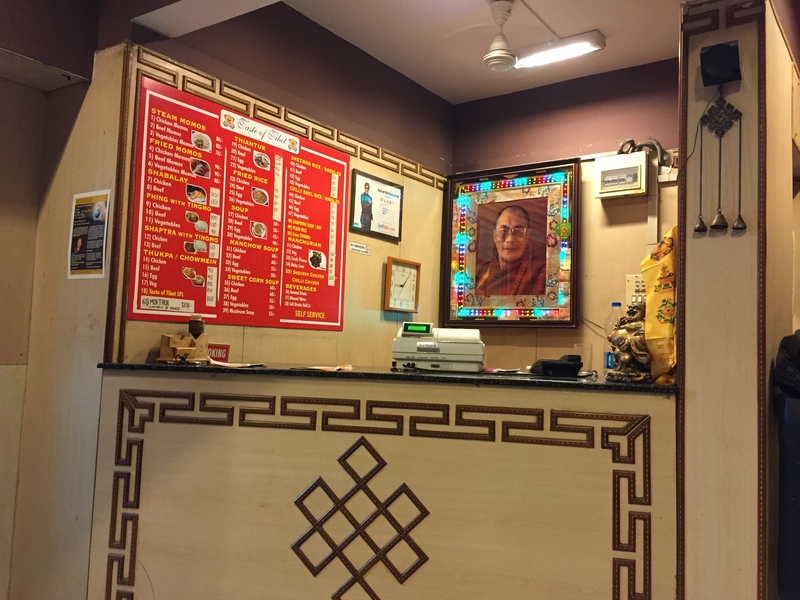 the devaraj cousins first introduced me to taste of tibet when i was an intern with peace child, and to this day it remains my favourite place in the city for momos. i’m sure there are better momos in other places, but this one has the prizes for location, price, and nostalgia wrapped up. whenever i return after a long time away, the guy behind the counter starts giggling a bit and asks me why i’ve not been in such a long time. it’s nice to be remembered, even if he’s laughing at me. this is where my friend sits and laughs while i place my order. bangalore, india. 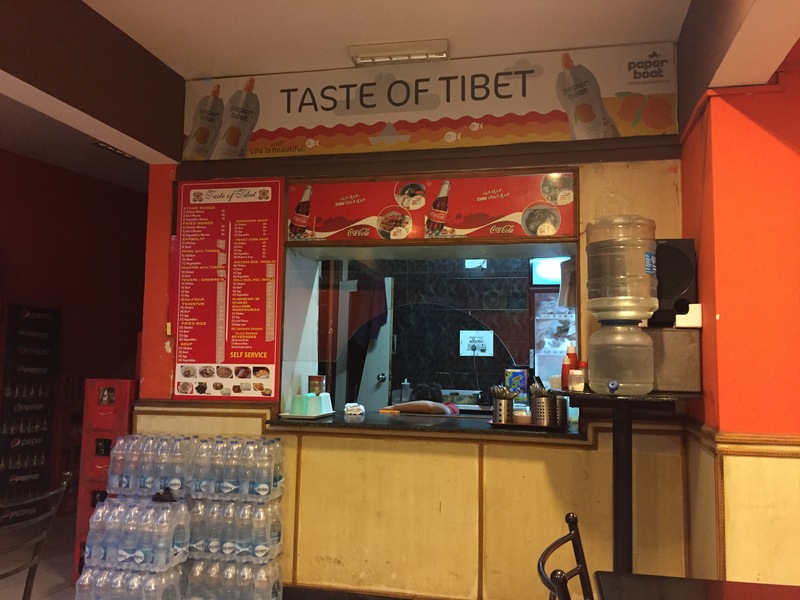 august 2015.
located in dubai plaza just next door to guzzlers, taste of tibet offers a wide variety of tibetan fare. 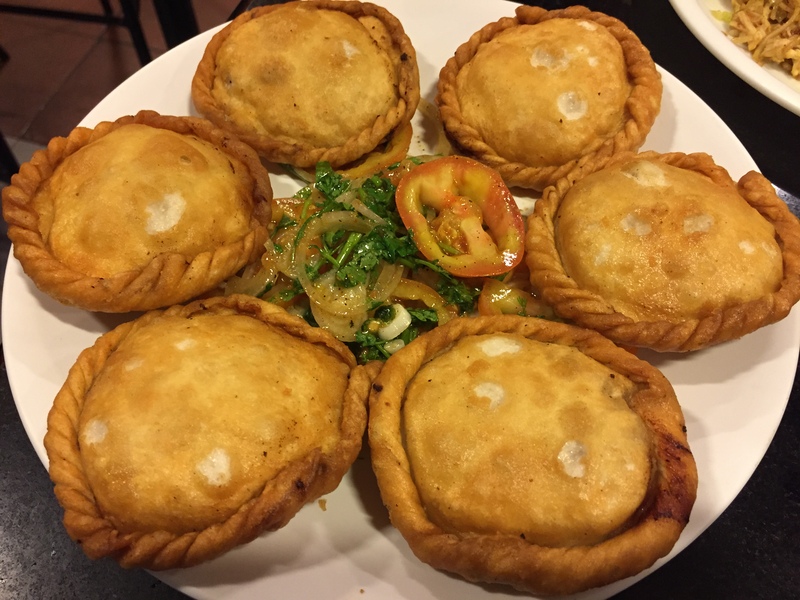 my standard order is a plate of steamed chicken momos, but there are plenty of other options if you are feeling adventurous. the counter where all the yummy food comes out. bangalore, india. august 2015.
when avni, gayatri, and i had dinner here a few weeks ago, we ordered quite the feast: momos, thukpa, shabalay, some lo mein [or maybe fried rice? it’s been a while, and my memory is sketchy], and a few other things that weren’t that memorable. the momos and the thukpa were the hit of the night, and i rather enjoyed the shabalay. and when we split the bill, it came to rs 200 per person, which is pretty unbelievable considering the amount of food we consumed. and yes, we finished all but a little of one dish. momos! bangalore, india. august 2015.
more of our dinner. bangalore, india. august 2015.
delicious shabalay. bangalore, india. august 2015.
i’m glad to know that avni and gayatri have now been introduced to the wonders of taste of tibet, and i will definitely be back again when my momo craving becomes too much to bear. location: 2nd floor, indo dubai plaza. #5, rest house road. off brigade road. landmark: next to guzzlers + across from pecos. prime location for getting my business. serves non-veg: yes, chicken and beef. serves drinks: only soft drinks. what we ordered: a lot. two thums up; one bottle of water [drinks]. 2 miso soups [starters]. 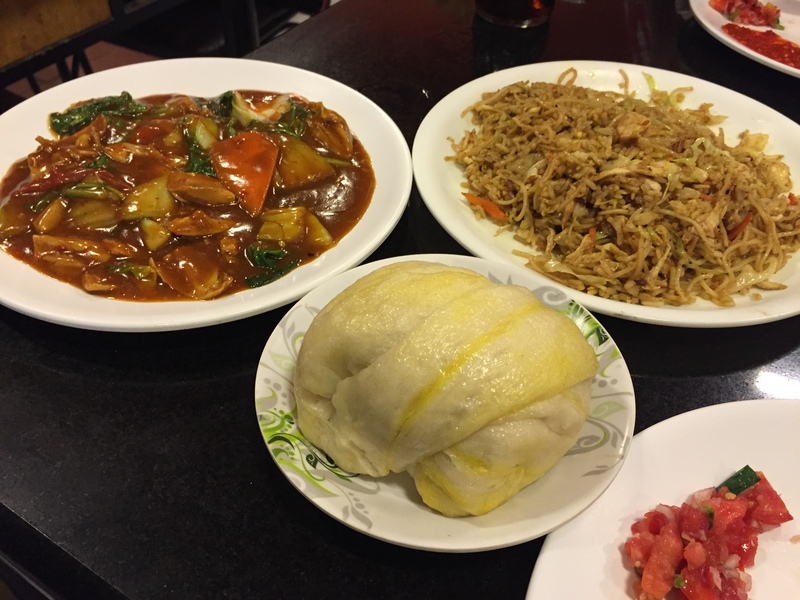 steamed chicken momos; shabalay; thukpa; lo mein / fried rice; and something else i don’t remember [mains]. our bill: rs 595, split three ways. which, if you can believe it, is the most i’ve ever spent there. fun facts: if you make friends with the jolly guy behind the counter, he will sometimes give you a discount [in other words, sometimes i’m rs 5 short and he lets me get away with it]. to keep in mind: the kitchen closes at 9.30pm, but they will let you stay until about 10 to finish your food. will i go back? over and over and over again. weekly roundup 27 // 2015.